Image of the Dual Pin-fed conical horn antenna with chokes . The dual pin-fed conical horn antenna with chokes is often used as a reflector feed for satellite television. 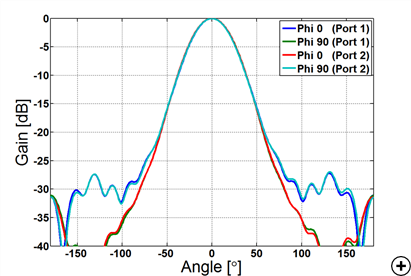 For this application, a dual-linear polarised feed with a bandwidth of more than 17% and a symmetrical radiation pattern is required. 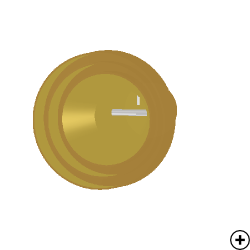 The two orthogonal coaxial feed pins allow for dual-linear operation and is typically used as part of a LNB (Low Noise Block-downconverter) in satellite television where the incoming signal contains information in both horizontal and in vertical directions. 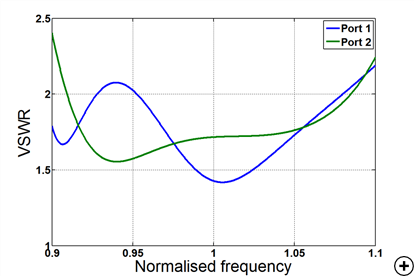 For this application, the antenna typically works in two frequency bands ("low" and "high") within the operating bandwidth. 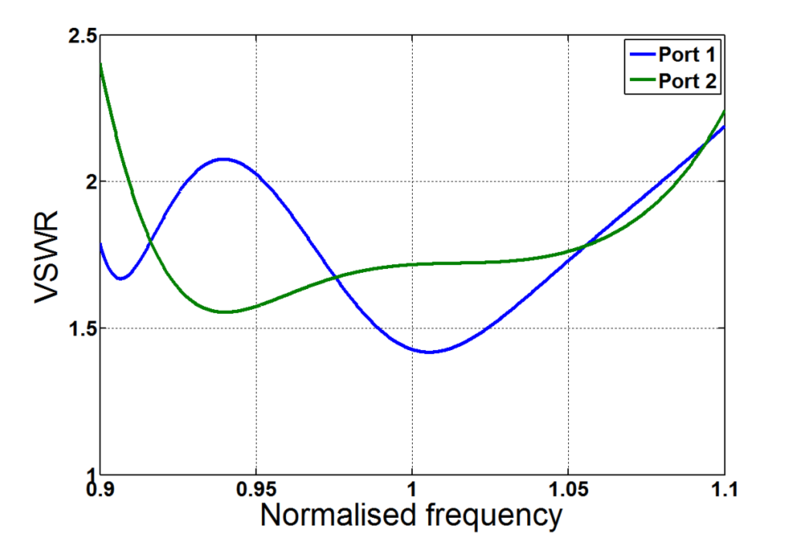 At each of these frequency bands, information from the two orthogonal planes ("vertical" and "horizontal") is extracted. The chokes are used to reduce front/back ratio, sidelobes and improves the axial symmetry of the radiation pattern. These properties are all advantageous for a reflector feed. 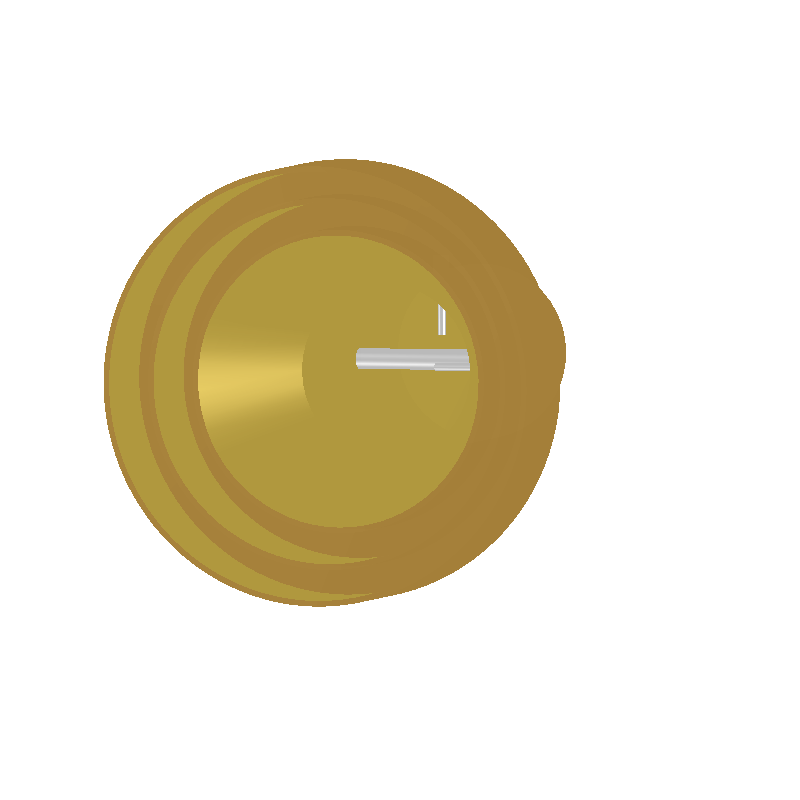 The design below is for 75 Ohm. Port 1 refers to the coax closest to the back wall of the waveguide. Port 2 refers to the coax closest to the waveguide opening, which is parallel to the shorting post and orthogonal to the coax of Port 1. According to datasheets, a VSWR < 2.5 for more than 17% is acceptable. The radiation pattern is in the form of an almost axially symmetric broad end-fire lobe with the E-field is polarised in the same direction as the excited feed-pin. 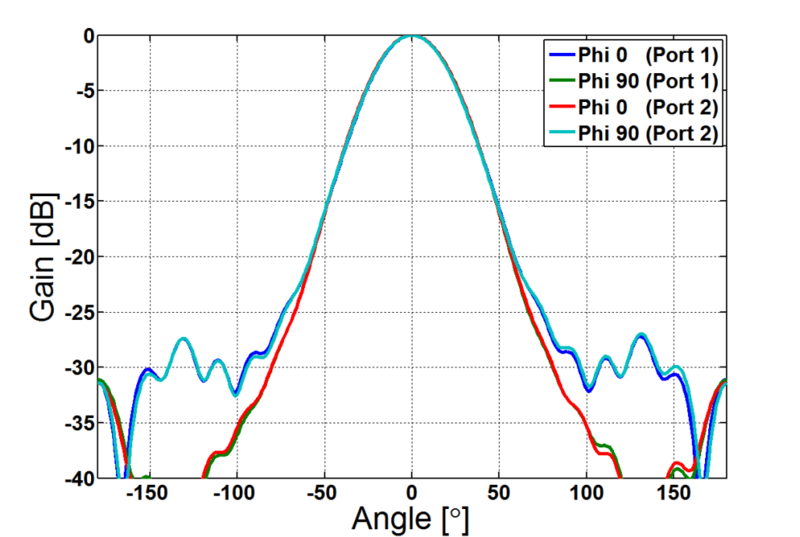 For comparison, the E-plane of Port 1 is in the plane where phi = 0°, whilst the E-plane of Port 2 is in the plane where phi = 90°. The E-planes and H-planes are almost identical for the two active feeds making this a suitable antenna for a reflector feed.